Win a new car. 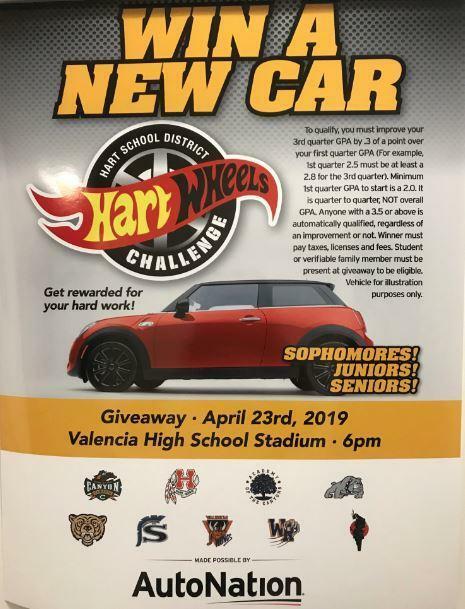 April 23, 2019 at 6pm at the Valencia HS Stadium. Showcase was an opportunity for students to share with the community the academic and practical skills they developed throughout the process of crafting and creating authentic and original products. This event was an opportunity for students, families, and faculty to celebrate and honor the accomplishments of the students while also providing a picture of the AOC experience at all grade levels. Enjoy. Reduced cost products available for college students. The AOC Wellness Club has launched a blog! Check out the link under "Quick Links" on the right side of the AOC Homepage! Use the links to see the 2018-2019 Hart District and COC calendars.